Namaskar! This is Bikas. My brief CV is as follows: Born in Dec. 1952, in Calcutta, to Bimal K. Chakrabarti and Pratima Chakrabarti. Got my Ph. D. Degree from Calcutta University in 1979. After that, I was post-doctoral fellow at Department of Theoretical Physics, University of Oxford and then at Institute for Theoretical Physics, University of Cologne. I joined Saha Institute of Nuclear Physics as faculty in September 1983, where I am Emeritus Professor since January 2018. Married to Mrs. Kaberi Chakrabarti. Have two sons: Kalyan Sundar Chakrabarti and Anindya Sundar Chakrabarti. At present, J. C. Bose National Fellow and Emeritus Professor (Former Professor & Director) at Saha Institute of Nuclear Physics, Kolkata, Honorary Emeritus Professor at S.N. Bose National Centre for Basic Sciences, Kolkata and Honorary Visiting Professor of Economics, Indian Statistical Institute, Kolkata. I have professional interest in statistical physics, condensed matter physics, computational physics, and their application to social sciences. See my papers, reviews or books. Our ideas on quantum search techniques, together with the researches from a number of other groups, have led to important developments recently. The advantages of quantum tunneling (through steep but narrow effective barriers) in searching for the global solution(s) of NP-hard problems (avoiding the innumerable localized ones), shown first by us in 1989 and in the subsequent works on Quantum Annealing, have ultimately led to an exciting development of a class of special-purpose (Analog) Quantum Computers. Some of its remarkably successful versions are now available commercially (e.g., D-Wave Systems): In 2015, NASA's Quantum Artificial Intelligence Laboratory installed the D-Wave 2X having over 1000 qubits, which is understood to be hundred million times faster for some typical computationally hard jobs (see also). See the ( highlighted ) last part of the entry "CITATIONS OF OUR WORK INCLUDE" for some typical recent citations in this context. Authored/co-authored more than 180 papers in refereed journals, 7 reviews [1 in Eur. Phys. J. B, 2 in Phys. Rep. & 4 in Rev. Mod. Phys. (out of a total 36 reviews published in RMP so far, authored/coauthored by at least one scientist from India, since 1929; source: 'Affiliation' India search at the journal site -- Errata excluded)], 10 books [3 Cambridge Univ. Press (1 going for Japanese Edition), 2 Oxford Univ. Press, 3 Springer, 2 Wiley-VCH]. For citations etc., see Google Scholar and ResearchGate. A few representative (review) Papers : ♦ Statistics of Self-Avoiding Walks on Random Lattices"(with K. Barat), Physics Reports (1995) ♦ Dynamic Transitions and Hysteresis (with M. Acharyya), Reviews of Modern Physics (1999) ♦ Kinetic Exchange Models for Income and Wealth Distributions (with A. Chatterjee), European Physical Journal (2007) ♦ Quantum Annealing and Analog Quantum Computations (with A. Das), Reviews Modern Physics Physics (2008) ♦ Failure Processes in Elastic Fiber Bundles (with A. Hansen & S. Pradhan), Reviews of Modern Physics(2010) ♦ Statistical Physics of Fracture, Friction and Earthquakes (with S. Biswas, T. Hatano, N. Kato & H. Kawamura), Reviews of Modern Physics (2012) ♦ Statistical Mechanics of Competitive Resource Allocation using Agent-Based Models (with A. Chakraborti,A. Chatterjee, D. Challet, M. Marsili & Y.-C. Zhang), Physics Reports (2015). Books : ♦ Quantum Ising Phases & Transitions in Transverse Ising Models (with A. Dutta & P. Sen), Springer, Heidelberg (1996) ♦ Statistical Physics of Fracture & Breakdown in Disordered Systems (with L. G. Benguigui), Oxford Univ. Press, Oxford (1997) ♦ Econophysics: An Introduction (with A. Chakraborti, A. Chatterjee & S. Sinha), Wiley-VCH, Berlin (2010) ♦ Quantum Ising Phases & Transitions in Transverse Ising Models (with J. -I. Inoue & S. Suzuki), Springer, Heidelberg (2013) ♦ Econophysics of Income & Wealth Distributions (with A. Chakraborti, S. R. Chakravarty & A. Chatterjee), Cambridge Univ. Press, Cambridge (2013) ♦ Sociophysics: An Introduction (with P. Sen), Oxford Univ. Press, Oxford (2014) ♦ Quantum Phase Transitions in Transverse Field Spin Models: From Statistical Physics to Quantum Information (with G. Aeppli, U. Divakaran, A. Dutta, T. F. Rosenbaum & D. Sen), Cambridge University Press, Cambridge & Delhi (2015) ♦ Statistical Physics of Fracture, Breakdown & Earthquake (with S. Biswas & P. Ray), Wiley-VCH, Berlin (2015). ♦ Quantum Spin Glasses, Annealing and Computation (with S. Tanaka & R. Tamura), Cambridge Univ. Press, Cambridge & Delhi (2017) [Contract signed between Morikita-Shuppan & CUP for Japanese Edition, 2017]. ♦ Econophysics of the Kolkata Restaurant Problem and Related Games: Classical and Quantum Strategies for Multi-agent, Multi-choice Repetitive Games (with A. Chatterjee, A. Ghosh, S. Mukherjee & B. Tamir), New Economic Windows Series, Springer International Publishing, Switzerland (2017), ( See also). Supervised Ph.D. theses of: S. S. Manna (1987) * A. K. Roy (1988) * P. Ray (1989) * M. Ghosh (1992) * P. Raychaudhuri (Sen) (1993) * K. Barat (1995) * M. Acharyya (1996) * A. Dutta (2000) * P. Bhattacharyya (2000) * A. Misra (2001) * A. Chakraborti (2003) * S. Pradhan (2005) * A. Chatterjee (2008) * A. Das (2008) * A. Ghosh (2014) * S. Biswas (2015) * A. Rajak (Jointly with A. Basu; 2016). ♦ Editorial of Topical Issue on Physics in Society, The European Physical Journal B, Vol 57 (2007) pp 121-125, incorporating 2 of ours, in an Editorial Choice-list of 21 "exemplifying pioneering" publications (earliest in 1872) in "Economy & Political Economy". ♦ Discussions on "pioneering" papers from "Chakrabarti's research group" (p 187; pp 185-206) in Applied Partial Differential Equations (by P A Markowich) Springer, Berlin (2007). ♦ Entry on Econophysics in The New Palgrave Dictionary of Economics, 2nd Ed., Vol 2, Macmillan, NY (2008), pp 729-732, beginning with "According to Bikas Chakrabarti (...), the term 'econophysics' was neologized in 1995 at the second Statphys-Kolkata conference in Kolkata (formerly Calcutta), India ..." . # Also, Econophysics has been assigned the Physics and Astronomy Classification Scheme (PACS) number 89.65Gh by the American Institute of Physics. ♦ Discussions on "influential" papers (p. 2803) from "Kolkata School" (p. 2808; pp. 2800-2826; see also pp. 2792-2800) in Encyclopedia of Complexity & System Science, Vol. 3, Springer, New York (2009). # Discussions on "influential" (p. 1705) & "elegant" (p. 1711) papers from "Kolkata School" (p. 1711) in Reviews of Modern Physics (2009) pp. 1703-1725 (by V. M. Yakovenko & J. Barkley Rosser). ♦ Feature article on "The Physics of our Finances", saying "So in 2000, Bikas Chakrabarti's team in the Saha Institute of Nuclear Physics in Kolkata, India ... [introduced another model with distributed savings, and with] this tweak, the model correctly reproduced the whole wealth distribution curve ... If these simple models do capture something of the essence of the real-world economics, then they offer some good news." , p. 41, New Scientist, 28 July, 2012 [See reproduced in the last section of this document]. ♦ Special issue on "Econophysics: Perspectives & Prospect", saying "The physicists, however, did not present a parallel perspective of this social science, at least not until recently when eminent physicists like Eugene H. Stanley, Bikas K. Chakrabarti, J. Doyne Farmer, Jean-Philippe Bouchaud and many others having joined the fray to create this new field which has now started to gain academic respect. ... As mentioned, Kolkata, India, occupies a crucial role in the history of this new science which has amongst its pioneers an Indian face, too. 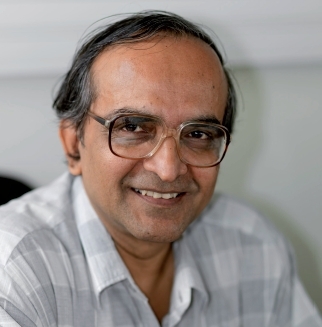 Bikas Chakrabarti of Saha Institute of Nuclear Physics, an eminent condensed matter physicist in his own rights, is, along with Stanley, one of the foremost contributors to this field. ...", in the Editorial and "... He (Bikas) likes to make something really happen. So he started to have meetings on econophysics and I think the first one was probably in 1995 (he decided to start it in 1993–1994). Probably the first meeting in my life on this field that I went to was this meeting. In that sense Kolkata is — you can say — the nest from which the chicken was born and Bikas gets, deservingly so, a lot of credit for that because it takes a lot of work to have a meeting on a field that does not really exist, so to say! After all who is going to come? If you have a meeting on standard fields like superconductivity there are many people who were happy to come to India to attend that meeting, but econophysics was something different. So he should get a lot of credit for this. ..." , said Eugene Stanley in his Interview (pp. 73-78) in IIM Kozhikode Society & Management Review, Vol. 2 (July 2013) © 2013 Indian Institute of Management Kozhikode, SAGE Publications. ♦ The book Interacting Multiagent Systems, Oxford Univ. Press (2014) by Pareschi & Toscani (Dept. Math., Univs. Ferrara & Pavia) dicussed the "Chakraborti-Chakrabarti model" as well as "Chatterjee-Chakrabarti-manna model" of income/wealth distributions in sections 5.3 (p. 167), 5.7 (pp. 205-210) and elsewhere. # In their paper Physica A (2016), Pareschi, Velluccci & Zanella (Dept. Math., Comp. Sc. & Engg., Univs.Ferrara & Rome) say "After the seminal models for wealth/opinion exchange for a multi-agent system introduced in Chakraborti & Chakrabarti [European Physical Journal B (2000)], Toscani [Communications in Mathematical Sciences (2006)] and Sen & Chakrabarti [Sociophysics: An Introduction, Oxford Univ. Press (2013)] some recent works considered ...". # The book Guidance of an Enterprise Economy, MIT Press (2016) by Shubik & Smith (Math. Inst. Economics, Yale University & Santa Fe Institute) noted: "It was shown in Chakraborti & Chakrabarti [European Physical Journal B (2000)] that uniform saving propensity of the agents constrains the entropy maximizing dynamics in such a way that the distribution becomes gamma-like, while (quenched) nonuniform saving propensity of the agents leads to a steady state distribution with a Pareto-like power-law tail [Chatterjee, Chakrabarti & Manna, Physica A (2004)]. A detailed discussions of such steady state distributions for these and related kinetic exchange models is provided in Econophysics of Income & Walth Distributions [Chakrabarti, Chakraborti, Chakravarty & Chatterjee, Cambridge University Press, 2013)." in p. 75 and elsewhere (pp. 40, 290). ♦ The book Macro-Econophysics, Cambridge University Press (2017), by Aoyama, Fujiwara, Ikeda, Iyetomi, Souma & Yoshikawa (Depts. Physics & Economics, Univs. Kyoto, Hyogo, Niigata, Nihon & Tokyo), begins with a "Foreword" from Bikas K. Chakrabarti. # In the section on "The position of econophysics in the disciplinary space" in Econophysics and Financial Economics, Oxford Univ. Press (2017), by Jovanovic & Schinckus, Department of Finance, University of Leicester, the authors write (pp. 83, 178): "To analyze the position of econophysics in the disciplinary space, the most influential authors in econophysics were identified. Then their papers in the literature were tracked by using the Web of Science database of Thomson-Reuters ... The sample is composed of Eugene Stanley, Rosario Mantegna, Joseph McCauley, Jean Philippe Bouchaud, Mauro Gallegati, Benoit Mandelbrot, Didier Sornette, Thomas Lux, Bikas Chakrabarti, and Doyne Farmer." ♦ In the thesis When Physics Became Undisciplined: An Essay on Econophysics (August 2018, Department of History and Philosophy of Science, University of Cambridge), Schinckus writes (pp. 15-16) "In order to reconstruct the subfield of econophysics, I started with the group of the most influential authors in econophysics and tracked their papers in the literature using the Web of Science database of Thomson -Reuters (The sample is composed of: Eugene Stanley, Rosario Mantegna, Joseph McCauley, Jean-Pierre Bouchaud, Mauro Gallegati, Benoît Mandelbrot, Didier Sornette, Thomas Lux, Bikas Chakrabarti and Doyne Farmer). These key authors are often presented as the fathers of econophysics simply because they contributed significantly to its early definition and development. Because of their influential and seminal works , these scholars are actually the most quoted authors in econophysics. Having the 10 highest quoted fathers of econophysics as a sample sounds an acceptable approach to define bibliometrically the core of econophysics." ♦ In their review paper on Wealth & Income Distribution International Journal of Social Science and Economic Research (January, 2019), de Paz et al., (Faculty of Engg., National Autonomous University of Mexico) write "There were three outstanding pioneering works in adopting the ideal gas model in which each agent represents a gas molecule trading money in an elastic collision: Bouchaud & Mézard [Physica A (2000)], Chakraborti & Chakrabarti [European Physical Journal B (2000)] and Drăgolescu & Yakovenko [European Physical Journal B (2000)].". ♦ FOCUS article "Breakthrough in Quantum Computation", saying "A new class of quantum computers utilizing quantum tunneling has been achieved (as pioneered by D-Wave with their 128 superconducting logic elements). The idea of computation using quantum annealing technique was first mooted by a group of Calcutta based scientists ..." in its Editorial Note and "... The seminal proposal (of Bikas Chakrabarti & his team from Saha Institute of Nuclear Physics, Calcutta) was taken up by other groups in the world ...", said Indrani Bose in Science & Culture (Indian Science News Association), Vol. 79 (Sept-Oct, 2013) pp. 381-382. # See also the FOCUS article "Quantum Annealing & Computation: A Brief Documentary Note", Science & Culture (Indian Science News Association), Vol. 79 (Nov-Dec, 2013) pp. 485-500 see arxiv version . For recent discussions, see Nature Physics, Vol. 10 (March 2014) by Boixo et al. (Univ. S. California, ETH, ...) saying "The phenomenon of quantum tunneling suggests that it can be more efficient to explore the state space quantum mechanically in a quantum annealer [Ray, Chakrabarti & Chakrabarti Physical Review B (1989); Finnila et al., Chemical Physics Letters (1994); Kadowaki & Nishimori, Physical Review E (1998)]. "; # International Journal of Quantum Information, Vol. 12 (June 2014) by Cohen & Tamir (Tel Aviv & Bar-Ilan Univs.) saying "Quantum annealing was first discussed by Ray et al. in 1989 [Ray, Chakrabarti & Chakrabarti, Physical Review (1989)]. "; # and the collection of 'Discussion & Debate' papers on Quantum Annealing: The Fastest Route to Quantum Computation? European Physical Journal: Special Topics, Vol. 224 (January 2015), where e.g., Silevitch, Rosenbaum & Aeppli (Univ. Chicago, Caltech, Swiss Fed. Inst. Tech., ... ) say "A quantum computer has the potential to exploit effects such as entanglement and tunneling and that appear on the atomic and molecular size scales to solve such problems dramatically faster than conventional computers [Ray, Chakrabarti & Chakrabarti, Physical review B (1989); Farhi et al., Science (2001); Santoro et al, Science (2002), Das & Chakrabarti, Reviews of Modern Physics (2008); Johnson et al., Nature (2011)].". Heim et al. (ETH Zurich & Google, Zurich) in Science (April 2015) say "Quantum annealing [Ray, Chakrabarti & Chakrabarti, Physical Review B (1989); Finnila et al., Chemical Physics Letters (1994); Kadowaki & Nishimori, Physical Review E (1998); Farhi et al., Science (2001); Das & Chakrabarti, Reviews of Modern Physics (2008)] uses quantum tunneling instead of thermal excitations to escape from local minima, which can be advantageous in systems with tall but narrow barriers, which are easier to tunnel through than to thermally climb over.". Mandra, Guerreschi, and Aspuru-Guzik (Dept. Chem. & Chem.-Bio., Harvard Univ.) in their Physical Review A (December 2015) begin with the introductory sentence "In 2001, Farhi et al. [Science (2001)] proposed a new paradigm to carry out quantum computation ... that builds on previous results developed by the statistical & chemical physics communities in the context of quantum annealing techniques [Ray, Chakrabarti & Chakrabarti, Physical Review B (1989); Kadowaki & Nishimori, Physical Review E (1998); Finnila et al., Chemical Physics Letters (1994); Lee & Berne, Journal of Physical Chemistry A (2000)].". Boixo et al. (Google, NASA Ames, D-Wave Group, ...; & acknowledging discussions with Farhi, Leggett, et al.) in their Nature Communications (January 2016) start the paper with the sentence "Quantum annealing [Finnila et al. Chemical Physics Letters (1994); Kadowaki & Nishimori, Physical Review E (1998); Farhi et al., arXiv (2002); Brooke et al., Science (1999); Santoro et al., Science (2002)] is a technique inspired by classical simulated annealing [Ray, Chakrabarti & Chakrabarti, Physical Review B (1989)] that aims to take advantage of quantum tunnelling.". Tran et al. (Quantum AI Lab & Intelligent Systems Division, NASA Ames, ...) in their Technical Report no. WS-16-12, Proc. 30th AAAI Conf. on AI (March 2016) on 'SCHEDULING A MARS LANDER' say "While large-scale universal quantum computers are likely decades away, special purpose quantum computational devices are emerging. The first of such are quantum annealers, special purpose hardware designed to run quantum annealing [Farhi et al., arXiv (2000); Das & Chakrabarti, Reviews of Modern Physics (2008); Johnson et al. Nature (2011); Smelyanskiy et al., arXiv (2012)], a metaheuristic that can make use of certain non-classical effects, such as quantum tunneling and quantum interference [Das & Chakrabarti, Reviews of Modern Physics (2008); Boixo et al., arXiv (2014)] for computational purposes.". Wang, Chen & Jonckheere (Dept. Electr. Engg., Univ. S. California) begin their Scientific Reports (May, 2016) by saying "Quantum annealing ... is a generic way to efficiently get close-to-optimum solutions in many NP-hard optimization problems ... (&) is believed to utilize quantum tunneling instead of thermal hopping to more efficiently search for the optimum solution in the Hilbert space of a quantum annealing device such as the D-Wave [Ray, Chakrabarti & Chakrabarti, Physical Review B (1989), Kadowaki & Nishimori, Physical Review E (1998)].". Matsuura et al. (Niels Bohr Inst., Yukawa Inst., Tokyo Inst. Tech., Univ. S. California) in their Physical Review Letters (June, 2016) introduce by saying "Quantum annealing, a quantum algorithm to solve optimization problems [Kadowaki & Nishimori, Physical Review E (1998); Ray, Chakrabarti & Chakrabarti, Physical Review B (1989); Brooke et al., Science (1999); Brooke et al. Nature (2001); Santoro et al., Science (2002); Kaminsky et al., Quantum Computing (Springer, 2004)] that is a special case of universal adiabatic quantum computing, has garnered a great deal of recent attention as it provides an accessible path to large-scale, albeit nonuniversal, quantum computation using present-day technology.". La Cour, Troupe & Mark (Appl. Res. Lab., Univ. Texas at Austin) write in the Introduction of their Journal of Statistical Physics (June, 2016) , "A related optimization procedure, quantum annealing, has been proposed for solving hard optimisation problems [Farhi et al, Science (2001); Das & Chakrabarti, Reviews of Modern Physics (2008)]. ... Several generations of devices that implement quantum annealing for the Ising model have been built by D-wave systems, Inc. and used to solve a variety of optimisation problems ... .". Muthukrishnan, Albash & Lidar (Depts. Physics, Chemistry, Electrical Engineering, ..., Univ. S. California) write in the Introduction of their Physical Review X (July, 2016) , "It is often stated that quantum annealing [Ray, Chakrabarti & Chakrabarti, Physical Review B (1989); Finnila et al. Chemical Physics Letters (1994); Kadowaki & Nishimori, Physical Review E (1998); Farhi et al., Science (2001); Das & Chakrabarti, Reviews of Modern Physics (2008)] uses tunneling instead of thermal excitations to escape from local minima, which can be advantageous in systems with tall but thin barriers that are easier to tunnel through than to thermally climb over [Heim et al., Science (2015); Das & Chakrabarti, Reviews of Modern Physics (2008), Suzuki, Inoue & Chakrabarti, Quantum Ising Phases & Transitions, Springer (2013)]. ... We demonstrate that the role of tunneling is significantly more subtle ....". Knysh (NASA Ames, California) in his investigations in Nature Communications (August, 2016) , on some eventual "bottlenecks", starts by writing "Quantum algorithms offer hope for tackling computer science problems that are intractable for classical computers. ... Those problems are targeted by the quantum adiabatic annealing algorithm [Kadowaki & Nishimori, Physical Review E (1998); Farhi et al., arXiv (2000); Das & Chakrabarti, Reviews of Modern Physics (2008)].". Cao et al. (Purdue Univ., Indiana, Marquette Univ., Wisconsin) write in the first two lines of their paper in Scientific Reports (September, 2016) "Quantum annealing (QA) uses the principles of quantum mechanics for solving unconstrained optimization problems [Finnila et al. Chemical Physics Letters (1994)], Kadowaki & Nishimori, Physical Review E (1998), Farhi et al., Science (2001), Das & Chakrabarti, Quantum Annealing & Related Optimization Methods, Springer (2005)]. Since the initial proposal of QA, there has been much interest in the search for practical problems where it can be advantageous with respect to classical algorithms [Das & Chakrabarti, Quantum Annealing & Related Optimization Methods, Springer (2005), Das & Chakrabarti, Reviews of Modern Physics (2008), ...], particularly simulated annealing ... .". Takata et al (Japan Sc. & Tech. Agency, Univ. Tokyo, Stanford Univ.) in their Scientific Reports (September, 2016) write "Meta-heuristic algorithms have been vastly studied to attack this (NP -hard) intractable problem. Simulated annealing (SA) is one of the most prevalent and successful methods in practice. Quantum annealing (QA) [Kadowaki & Nishimori, Physical Review E (1998); Das & Chakrabarti, Reviews of Modern Physics (2008)] has been proposed as a method which can potentially give better solutions than SA. The hardware to implement QA has also been recently developed and its true performance is under consideration.". Wild et al. (Depts. Phys. & Engg., Harvard Univ., Caltech, CUNY; Tech. Univ. Munich; Univ. California Berkeley) in their Physical Review Letters (October 2016) start by saying "The adiabatic theorem provides a powerful tool to characterize the evolution of a quantum system under a time-dependent Hamiltonian. ... Adiabatic evolution can also serve as a platform for quantum information processing [Farhi et al., arXiv 2000; Farhi et al., Science (2001); Das & Chakrabarti, Reviews of Modern Physics (2008); Bapst et al., Physics Reports (2013), Santoro & Tosatti, Journal of Physics A: Math. Gen. (2006); Laumann et al., European Physical Journal: Spl. Top. (2015)].". Chancellor et al. (Depts. Phys. & Engg., Univs. Durham, Oxford, London) in the introduction of their Scientific Reports (November, 2016) say "There have been many promising advances in quantum annealing, since the idea that quantum fluctuations could help explore rough energy landscapes [Ray, Chakrabarti & Chakrabarti, Physical Review B (1989)], through the algorithm first being explicitly proposed [Finnila et al. Chemical Physics Letters (1994)], further refined [Kadowaki & Nishimori, Physical Review E (1998)], and the basic concepts demonstrated experimentally in a condensed matter system [Brooke et al., Science (1999)]. ... For an overview ... see Das & Chakrabarti, Reviews of Modern Physics (2008)". Rams, Mohseni & del Campo (Instute of Physics, Krakow; Google Quantum AI, Venice, CA & Univ. Massachusetts, Boston) start their New Journal of Physics (December, 2016) paper with the sentence "Techniques to control or assist adiabatic dynamics are of broad interest in quantum technologies, including quantum simulation and quantum computation [Das & Chakrabarti, Reviews of Modern Physics (2008), Cirac & Zoller, Nature Physics (2012)].". Ohzeki (Tohoku University) start his Scientific Reports (January, 2017) paper with "Quantum annealing (QA)... was originally proposed as a numerical computational algorithm [Kadowaki & Nishimori, Physical Review E (1998)] inspired by simulated annealing [Kirkpatrick, Gelatt & Vecchi, Science (1983)] , and the exchange Monte Carlo simulation [Hukushima & Nemeto Journal of the Physical Society of Japan (1996)]. In QA, the quantum tunneling effect efficiently finds the ground state even in the many-valley structure of the energy landscape therein [Ray, Chakrabarti & Chakrabarti, Physical Review B (1989); Apolloni, Carvalho & de Falco, Stochastic Process & their Applications (1989); Das & Chakrabarti, Reviews of Modern Physics (2008)].". Dridi & Alghassi (1QB Information Technologies, Vancouber) in their Scientific Reports (February, 2017) mentions in their introduction "Prime factorization also connects to many branches of mathematics; two branches relevant to us are computational algebraic geometry [Cox et al., Using Algebrig Geometry, Springer, 1998] and quantum annealing [Kadowaki & Nishimori, Physical Review E (1998); Farhi et al., Science (2001); Das & Chakrabarti, Reviews of Modern Physics (2008)].". Smelyanskiy et al. (Google, California; NASA Ames, California; Michigan State Univ., Michigan; etc.) in their Physical Review Letters (February, 2017) start their introduction with "Quantum annealing (QA) has been proposed as a candidate for a speed-up of solving hard optimization problems [Kadowaki & Nishimori, Physical Review E (1998); Brooke et al., Science (1999); Farhi et al., Science (2001)]. ... Conventionally, QA is related to quantum tunneling in the landscape that is slowly varied in time [Das & Chakrabarti, in Quantum Annealing & Related Optimization Methods, Eds. Das & Chakrabarti, Springer (2005)].". Mandrà, Zhu & Katzgraber (Harvard Univ. Massachusetts; NASA Ames, California; Texas A & M Univ, Texas; Santa Fe Institute, New Mexico; etc.) in their Physical Review Letters (February, 2017) mentions in their introduction "More recently, the quantum counterpart of simulated annealing (usually called “quantum annealing”) was suggested [Finnila et al., Chemical Physics Letters (1994); Kadowaki & Nishimori, Physical Review E (1998); Brooke et al., Science (1999); Farhi et al., Science (2001); Santoro et al., Science (2002), Das & Chakrabarti, in Quantum Annealing & Related Optimization Methods, Eds. Das & Chakrabarti, Springer (2005); Santoro & Tosatti, Journal of Physics A (2006); Das & Chakrabarti, Reviews of Modern Physics (2008); Morita & Nishimori, Journal of Mathematical Physics (2008)].". Azinovic et al. (ETH Zurich; RIKEN, Wako-shi; Microsoft Research, Redmond; etc.) in their SciPost Phys (April, 2017) says "While Simulated Annealing makes use of thermal excitations to escape local minima, quantum annealing [Ray, Chakrabarti & Chakrabarti, Physical Review B (1989); Finniela et al., Chemical Physics Letters (1994), Kadowaki & Nishimori, Physical Review E (1998); Farhi et al., Science (2001); Das & Chakrabarti, Reviews of Modern Physics (2008)] uses quantum fluctuations to find the ground state of a system .". Zhang et al. (Stanford Univ., California; Cray, Seattle; Universidad Complutense, Madrid; Univ. Southern California, Los Angeles) in their Scientific Reports (April, 2017) says in the introduction "Quantum annealers [Kadowaki & Nishimori, Physical Review E (1998); Farhi et al., Science (2001)] provide a unique approach to finding the ground-states of discrete optimization problems, utilizing gradually decreasing quantum fluctuations to traverse barriers in the energy landscape in search of global optima, a mechanism commonly believed to have no classical counterpart [Kadowaki & Nishimori, Physical Review E (1998); Farhi et al., Science (2001); Finnila et al., Chemical Physics Letters (1994); Brooke et al., Science (1999); Santoro et al., Science (2002); Das & Chakrabarti, Reviews of Modern Physics (2008); Ray, Chakrabarti & Chakrabarti, Physical Review B (1989)].". Hormozi et al. (MIT, Massachusetts; ETH Zurich, Zurich; Microsoft Research, Washington; etc.) in the Introduction of their paper Physical Review B (May, 2017) says "A quantum annealing device is a machine that physically implements this approach by realizing a time-dependent Hamiltonian, which attempts to follow the adiabatic quantum algorithm [Farhi et al., arXiv (2000); Farhi et al., Science (2001)]; Das & Chakrabarti, Reviews of Modern Physics (2008)].". Mott et al. (Depts. Physics & Electrical Engg., Caltech, California; Univ. Southern California, California) write in the 3rd line of their letter Nature (October, 2017) write "Here we use quantum [Kadwaki & Nishimori, Physical Review E (1998); Das & Chakrabarti, Reviews of Modern Physics (2008), Neven et al., arXiv (2008); Pudenz & Lidar, Quantum Information Processing (2013)] and classical [Kirkpatrick et al., Science (1983); Katzgraber et al., Journal of Statistical Mechanics (2006)] annealing (probabilistic techniques for approximating the global maximum or minimum of a given function) to solve a Higgs- signal-versus-background machine learning optimization problem, mapped to a problem of finding the ground state of a corresponding Ising spin model.". Bottarelli et al. (Univ. Verona, Verona), in their FOCUS paper in Soft Computing (January, 2018) mentions, while discussing in the section on Quantum Annealing (QA) & D-Wave quantum annealers/computers, "The advantage of QA is the dependency of the tunneling probability both on the height and the width of the potential barrier, which gives it the ability to move in an energy landscape where local minima are separated by tall barriers, provided that they are narrow enough [Ray, Chakrabarti & Chakrabarti, Physical Review B (1989)].". Albash & Lidar (Univ. Southern California) in their review paper Reviews of Modern Physics (January, 2018 ) note that the exponential run time problem in classical annealing comes from "... energy barriers in the classical cost that scale with problem size to foil single-spin- update Simulated Annealing (SA). This agrees with the intuition that a Stoquastic Adiaabatic Quantum Comuptation advantage over SA is associated with tall and thin barriers [Ray, Chakrabarti & Chakrabarti, Physical Review B (1989); Das & Chakrabarti, Reviews of Modern Physics (2008)].". Additional discussions on these and Das, Chakrabarti & Stinchcombe, Physical Review E (2005); Rajak & Chakrabarti, Indian Journal of Physics (2014) & Suzuki, Inoue, Chakrabarti, Quantum Ising Phases & Transitions in Transverse Ising Models, Springer (2013) are also included. Baldassi & Zechchina (Bocconi Inst., Milan & ICTP, Trieste) start their paper Proceedings of the National Academy of Science (February, 2018 ) with the sentence "Quantum annealing aims at finding low-energy configurations of nonconvex optimization problems by a controlled quantum adiabatic evolution, where a time-dependent many-body quantum system which encodes for the optimization problem evolves toward its ground states so as to escape local minima through multiple tunneling events [Ray, Chakrabarti & Chakrabarti, Physical Review B (1989); Finnila et al., Chemical Physics Letters (1994); Kadwaki & Nishimori, Physical Review E (1998); Farhi et al., Science (2001); Das & Chakrabarti, Reviews of Modern Physics (2008)].". Rodrıguez-Laguna and Santalla (Univ. Madrid) in their paper on "Building an Adiabatic Quantum Computer Simulation in the Classroom" American Journal of Physics (May, 2018) start their Introduction by saying "Interest in quantum computation is increasing lately, since it might be the next quantum technology to take off. Exciting new spaces for exploration have appeared, [and among them] we have chosen adiabatic quantum computation [Farhi et al., Science (2001); Das & Chakrabarti, Reviews of Modern Physics (2008); Santoro et al., Science (2002)] and developed a gentle introduction which can be delivered in two sessions, a theoretical and a practical one. ... See also [Suzuki, Inoue & Chakrabarti, Quantum Ising Phases & Transitions, Springer (2013)].". Also, Moran (Caltech) in her "A Tool for Introducing Quantum Computing into the Classroom" Frontiers in Physics (July, 2018) writes "This paper focuses on universal gate quantum computation, but it is useful to note the plethora of work in quantum computing focusing on quantum annealing [Das & Chakrabarti, Reviews of Modern Physics (2008); Albash & Lidar, Reviews of Modern Physics (2018); Tanaka, Tamura & Chakrabarti, Quantum Spin Glasses, Annealing & Computation, Cambridge Univ. Press (2017).". Mishra, Albash & Lidar (Depts. Physics, Chemistry, Electrical Engineering, Univ. Southern California) begin their paper Nature Communications (July, 2018) with the sentence "Quantum annealing [Apolloni, Carvalho & de Falco, Sotcastic Processes & Applications (1989); Apolloni, Cesa-Bianchi & de Falco, in Stochastic Process, Physics & Geometry, World Scientific (1990); Ray, Chakrabarti & Chakrabarti, Physical Review B (1989); Somoraji, Journal of Physical Chemistry (1991); Amara, Hsu & Straub (1993), Journal of Physical Chemistry (1993); Finnila et al., Chemical Physics Letters (1994); Kadwaki & Nishimori, Physical Review E (1998); Das & Chakrabarti, Reviews of Modern Physics (2008)], also known as the quantum adiabatic algorithm [Farhi et al. arXiv (2000); Farhi et al., Science (2001)] or adiabatic quantum optimization [Smelyanski, Toussaint & Timukin, arXiv (2001); Reichardt, in Proceedings of the ACM Symposium on Theory of Computing: ACM-36 (2004)] is a heuristic quantum algorithm for solving combinatorial optimization problems.". Venuti & Lidar (Depts. Physics, Chemistry, Electrical Engineering, Univ. Southern California) begin their paper Physical Review A (August, 2018), saying "Quantum annealing and adiabatic quantum computation are promising candidates in the search for quantum-enhanced information processing [Das & Chakrabarti, Reviews of Modern Physics (2008), Albash & Lidar, Reviews of Modern Physics (2018)]. Both can be viewed as adiabatic state preparation protocols [Aharonov & Ta-Shma, in Proc. 35th Annual ACM Symposium on Theory of Computing (2013)], where the target state is typically the solution to a computational problem such as optimization, or a state from a distribution that one wishes to sample from.". Pichler et al. (Harvard-Smithsonian Center, Dept. Physics, Harvard Univ., Cambridge & Univ. California, Berkeley) begin their arXiv (August, 2018) paper with the (first two) sentences "Quantum optimization is a paradigm to solve combinatorial optimization problems by utilizing controlled dynamics of quantum many-body systems [Farhi et al., Science (2001); Kadwaki & Nishimori, Physical Review E (1998); Das & Chakrabarti, Reviews of Modern Physics (2008); Albash & Lidar, Reviews of Modern Physics (2018)]. The key idea is to steer the dynamics of quantum systems such that their final states provide solutions to optimization problems [Das & Chakrabarti, Reviews of Modern Physics (2008)].". See also, * arXiv (September, 2018) by Schuetz et al. (Harvard Univ., Innsbruck Univ., Kavli Inst. & Max Planck Inst. ), providing "... a natural architecture for the implementation of quantum algorithms, such as quantum annealing [Das & Chakrabarti, Reviews of Modern Physics (2008)] or ..." as mentioned in its Introduction, and * Pichler et al. (Harvard-Smithsonian Center, Dept. Physics, Harvard Univ., Cambridge & Univ. California, Berkeley) beginning their arXiv (September, 2018) paper with the sentence "Various quantum algorithms have been proposed in recent years to solve combinatorially hard optimization problems [Farhi et al., Science (2001); Smelyanski, Toussaint & Timucin, arXiv (2001); Das & Chakrabarti, Reviews of Modern Physics (2008); Albash & Lidar, Reviews of Modern Physics (2018); Santoro et al., Science (2002); Boixo et al., Nature Communication (2013); Johnson et al., Nature (2011); Ronnow et al., Science (2014); Houck, Tureci & Koch, Nature Physics (2012); Smolin & Smith, arXiv (2013); Wang et al., arXiv (2013); Shin et al., arXiv (2014); Harrow & Montanaro, Nature (2017)].". Jiang et al. (Dept. Computer Science, Purdue Univ., Quantum Computing Institute, Oak Ridge National Laboratory) reporting on their quantum annealing framework for prime number factorization in Scientific Reports (December, 2018) write "In this contribution, we introduce a new procedure for solving the integer factorization problem using quantum annealing [Kadwaki & Nishimori, Physical Review E (1998); Das & Chakrabarti, Reviews of Modern Physics (2008)] which utilizes adiabatic quantum computation. ... Quantum Annealing was introduced [Kadwaki & Nishimori, Physical Review E (1998)] to solve optimization problems using quantum fluctuations to transit to the ground state, compared to simulated annealing which uses thermal fluctuations to get to the global minimum. Quantum fluctuations such as quantum tunneling [Ray, Chakrabarti & Chakrabarti, Physical Review B (1989)] provide ways of transitions between states. The transverse field controls the rate of the transition, as the role of temperature played in simulated annealing.". Vepsäläinen, Danilin & Paraoanu (Dept. Appl. Physics, Aalto Univ. 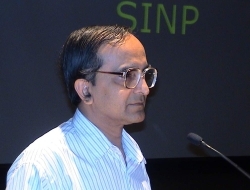 ), reporting on adiabatic manipulation of the quantum state in quantum information processing in Science (February, 2019) write in the Introduction "For adiabatic quantum computing [Farhi et al., Science (2001)], quantum annealing [Das & Chakrabarti, Reviews of Modern Physics (2008), Johnson et al., Nature 2011] , and holonomic quantum computing [Sjöqvist et al., New Journal of Physics (2012); Zanardi & Rasetti, Physics Letters A (1999); Abdumalikov et al., Nature (2013], shortcuts to adiabaticity would be one important route to quantum advantage [Boixo et al., Nature Physics (2014)].". Dridi, Alghassi & Tayur (Quantum Computing Group, Carnegie Mellon Univ.) in their review paper on computational algebraic geometry and quantum optimization (arXiv, March, 2019; Comments: Commemorating 30 years since the publication of Ray, Chakrabarti & Chakrabarti, Phys. Rev. B 39 (1989) 11828; Journal reference: Special issue of Science & Culture, 2019 ) write in their Summary & Discussion section "As we mentioned in the Introduction, we are travelers in a journey that our ancients started. Evidence of 'practical mathematics' during 2200 BCE in the Indus Valley has been unearthed that indicates proficiency in geometry. Similarly, in Egypt (around 2000 BCE) and Babylon (1900 BCE) ... Algebra ... reached a new high watermark during the golden age of Islamic mathematics around 10th Century AD ... The next significant leap in algebraic geometry, a 'Renaissance', in the 16th and 17th century, is quintessentially European ... Computational algebraic geometry begins with the Buchberger in 1965 ... Magnetism simply could not be explained by classical physics, and had to wait for quantum mechanics. The workhorse to study it mathematically is the Ising model, conceived in 1925. Quantum computing was first introduced by Feynman in 1981 [Feynman, International Journal of Theoretical Physics (1982)]. The study of Ising models that formed a basis of physical realization of a quantum annealer (like D-Wave devices) can be traced to the 1989 paper by Ray, Chakrabarti and Chakrabarti [Physical Review B (1989)]. Building on various adiabatic theorems of the early quantum mechanics and complexity theory, adiabatic quantum computing was proposed by Farhi et al. in 2001 [Science (2001)]. Which brings us to current times. The use of computational algebraic geometry ... in the study of adiabatic quantum computing ..., is conceived by us, the authors, of this expository article. Let us close with the Roman poet Ovid (43 BC-17 AD): 'Let others praise ancient times; I am glad I was born in these.'.". Sato et al. (School of Sc. & Engg., Saitama Univ. ; Fujitsu Laroratories; Japan Science & Technology) write in the Introduction of their paper Physical Review E (April, 2019) "There are two famous annealing concepts [Kirkpatrick, Gelatt Jr. & Vecchi, Science (1983); Ray, Chakrabarti & Chakrabarti, Physical Review B (1989)]: one is the simulated annealing method in which the temperature of the system is controlled to search the global minimum; another is the quantum annealing method which uses quantum effects." .